"Chocolate Popsicle! Chocolate Popsicle!" Nala screamed repeatedly in a hoarse voice. Chocolate stirs up the same emotion in me, I feel her, I really do. I probably ate about a bar of dark chocolate a day while preggers with Kaio. I'd buy those 1lb bars from Trader Joe's and just gnaw away piece by piece working at my desk. I love chocolate. Then I found out that I owe my life to chocolate. I know we all think that we couldn't exist without our favorite food, but in this case it's true. I literally would never been born had it not been for chocolate. My mom may not have survived the first month of her life. And then Kaio and Nala would never have been created either. So when Nala begs me for hot chocolate or a piece of dark chocolate, I never mind. My kids and I, we eat all the dark chocolate we can get our dirty little hands on. We owe our lives to my grandfather and grandmother, who fought despite the odds to keep my mom alive. She was born a premature baby in Romania, at the time a communist country, lacking in sophisticated medical equipment and basic supplies. The first hospital my grandma went to for labor turned her down because she looked too thin to be pregnant. Mom was born 1.5kilos (3.3lbs) and they told grandma that she had a 2% chance of being normal. The Romanian ICU unit was a pair of warm water bottles and cotton wrapped around the baby. That's so Macgyver it doesn't even seem possible. In communist countries the government provides you with everything, equally. But the problem is that usually there are shortages in the allocation, for everyone save the government officials. The hospital did not have the medicine needed to keep my mom alive. My grandfather sold his stamp collection, the only thing he had of value since the Romanian Lei wasn't worth anything, to buy chocolate and medicine from other countries. This was illegal, by the way. This shows me his heart pulsed with compassion and drive to selflessly fight for his family. A bit surprising because I never pictured him in that light as a child growing up. This just goes to show what an incredibly dense and self centered kid I was. He hated that country's government and fought relentlessly to get our family out of there. Went to jail, hid on trains, and fled to Hungary a couple times in the process. I wish I knew more details of it all but dementia began to set in before he started recounting the stories. 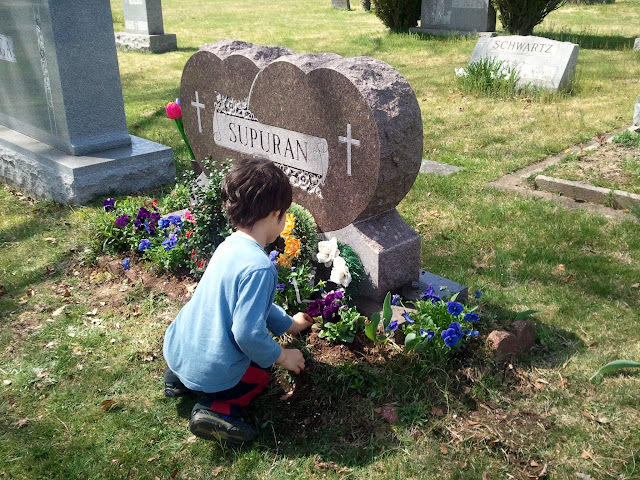 We took a trip last Monday to visit my grandparents' grave in Trenton. Kaio remembers my grandfather, Tata, they had a magical connection that I wrote about here. He died when Kaio was less a year and a half, but a solemn look crossed his face as I explained who we were visiting. Maybe I shouldn't of done that, maybe he's too young to be burdened with such strong emotions. 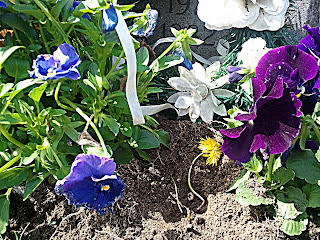 But he picked a dandelion and added it to the flowers we planted; a sweet gesture of remembrance.